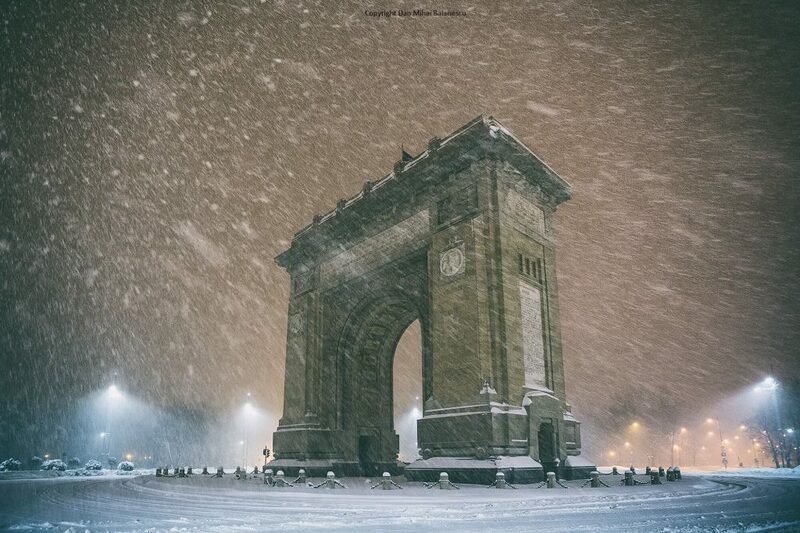 The city of Bucharest is slowly starting to appear on the bucket list of numerous travelers across the globe, thanks to its charming Old Town, intrinsic architecture and its active nightlife. There is, however, much more to Romania than what its capital city has to offer. In fact, some of the most interesting sights can be seen beyond city borders, nestled between tall mountain ranges and hidden between remote swampy lands. 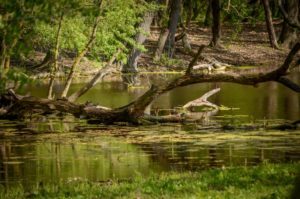 One of the coolest natural places of the list is located in the south-eastern part of Bucharest, merely a few kilometers away from the city’s center. It’s the first natural urban park in the entire country and aims to protect the swampy wetlands and its inhabitants situated in the periphery of the capital. You can explore the depths of the nature park on a 2.5 km long decked path which can be done either on foot or on bike. The marked trail provides an insight to the local urban biodiversity, exhibiting birds, marine life and mammals in their natural habitat. The park can be visited at any time and if you request a guided tour you can do so by simply shooting them an e-mail. 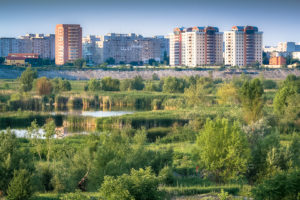 Located approximately 70 kilometers south of Bucharest, close to the Bulgarian border, is another nature reserve known for its unique wetlands. A Ramsar Site since 2011, The Comana Natural Park boasts nearly 25,000 hectares of protected land, spanning pastures, forest, swamps and marshlands. You can actually spend an entire day in the park, thanks to the myriad of sights to see, including nature trails leading to flocks of birds and even old monasteries with an impressive historical background. 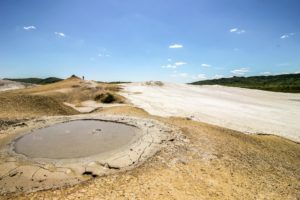 If you’re looking for unique scenery, then the mud volcanoes of Buzău County should definitely be on your list of must-see natural destinations around Bucharest. Located at two-and-a-half hours’ drive from the capital, the mud volcanoes offer a surreal, moon-like landscape to visitors. These impressive volcanoes are formed thanks to erupting gases coming from a depth of 3,000 meters. They bring salty water and mud in the process, hence the name. You can visit numerous such mud volcano sites, the most popular being the one in Pâclele Mari. You can actually drive to the entrance and visit the site in exchange for a small fee. But if you don’t like crowds, then visit the mud volcanoes of Pâclele Mici, which many overlook due to the fact that you need to climb a small hill in order to get to them. In my mind they were more spectacular and impressive, so you should include them in your bucket list as well. There are also a set of mud volcanoes near Berca which can be visited free of charge. 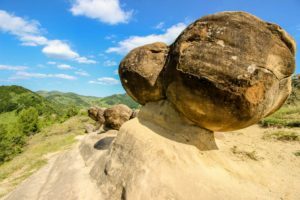 My personal favorite from the “must-see natural destinations around Bucharest” list, the so-called Trovanți (Concretions in English) can be found in the small village of Ulmet, 30 minutes’ drive away from the previously-mentioned Mud Volcanoes. After you arrive to Ulmet on a more-than-bumpy road, leave your car in front of one of the villager’s home and don’t hesitate to ask for directions because you probably won’t find any signposts. You’ll only need to walk for a couple of minutes through some charming green pastures before you reach the hill with the fascinating rocks. Specialists proclaim that the rocks are formed in a sandy terrain which is continuously washed and sedimented by the weather conditions, thus having such a peculiar form. Before you head back towards your car, make sure you look around because the view is also pretty spectacular. If you liked the previous attraction, you’ll definitely fall in love with this mountain range. Located on the border between Prahova and Brașov Counties, 150 kms away from Bucharest, the Ciucaș Mountains are set to impress. They’re made up of limestone ravines, high peaks and memorable landscapes. With nearly 30 different marked tourist paths, ranging from easy to difficult, the Ciucaș mountain range has something to offer to every member of the family. If you really want to treat yourself to an even more fantastic view, make sure you visit at the beginning of the summer months in June-July, when you can witness entire fields of Rhododendrons or wild peonies in full bloom. The Bucegi Mountains are one of the most popular tourist destinations for the people of Bucharest. This is in part thanks to the beloved Prahova Valley, which attracts tourists with its castles (see Peles Castle for example), ski slopes and wide range of activities throughout the year. 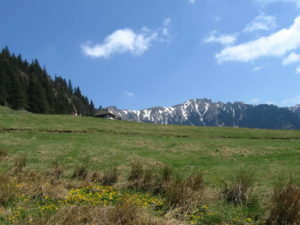 You can enjoy the best view of the valley from the Caraiman Cross, which you can reach either on foot or by cabin car. From here you can also reach the two most celebrated rock formations of the country, the Babele and the Sphinx. Besides these, there are a myriad of nature trails offering sensational views for those who love the great outdoors. If it’s dramatic landscapes you’re looking for, the Piatra Craiului Mountains will surely not disappoint. The mountains are made up of limestone and offer some sensational ridges, challenging trails and various karstic shapes. 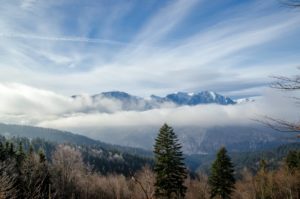 These are definitely the most exciting mountains of Romania, which will ignite your sense of adventure the minute you Google “Piatra Craiului Mountains”. They also offer the widest variety of natural landscapes, ranging from awesome caves to deep river gorges. It’s somewhat like a playground for adults, so you can basically start planning your trip there ASAP. One of the 7 UNESCO-protected World Heritage Sites in Romania, the magnificent Danube Delta is not to be missed! It is the best-preserved river delta in Europe and also the second largest, giving home to a large number of birds, plants, fish, amphibians and other species. In order to avoid the crowds and the masses of mosquitos, my advice would be to visit the Danube Delta either during May or in September. The scenery is best observed from a boat that’s not motor-powered, so you might want to consider opting for a guided canoe or kayak tour instead of a group tour with a motorboat, which will definitely scare all the birds away. The oldest nature reserve of the country, Letea Forest can be found close to the border with Ukraine. 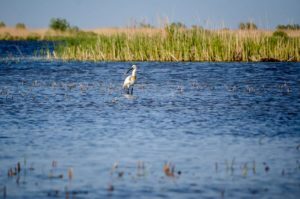 It is also part of the Danube Delta Nature Reserve, however thanks to its unique flora and fauna, I felt it deserved a separate place on the ” must-see natural destinations around Bucharest” list. The forest contains numerous procumbent trees, including lianas which can grow up to 25 meters. If you’re in luck, you can encounter at least a few of the hundreds of horses, which have either been let go or escaped from their owners in the past and roam the forest freely. Unlike the previous mountain ranges, the Măcin Mountains are not part of the majestic Carpathians, but stand alone on the Dobrogea Plateau of Romania. They are the oldest mountains in the country and probably the most attainable ones as well, since the tallest peak stands at merely 467 meters. 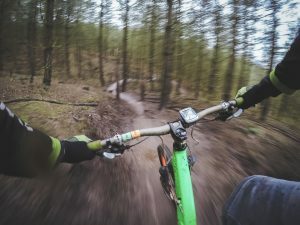 Besides the fact that you can leisurely go hiking together with your small children, mountain biking and horseback riding is also possible on the trails of the nature park. As a final note, I’d just like to emphasize that the majority of these natural destinations are protected areas as well. Enjoy them responsibly, don’t leave your rubbish on the ground and make sure you don’t harm any of the local fauna or flora in order to maintain these wonderful places for future generations to enjoy as well. 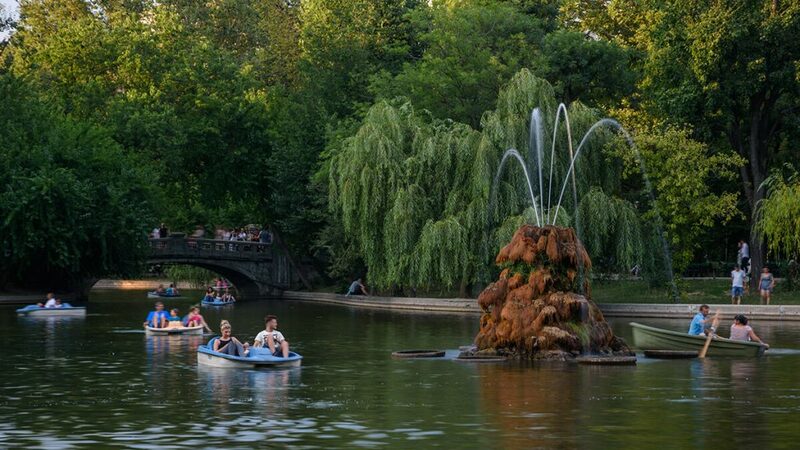 So tell us: which of the 10 must-see natural destinations around Bucharest do you like best? Would you prefer mountain views over wetlands or would go for something crazier, say a strange lunar landscape? Let us know in the comments section below! Adrienn Takacs is a Hungarian freelance travel writer and blogger at CityoftheWeek , based in the heart of Transylvania, Romania. She hates the Dracula stereotype her country is so famous for and aims to promote the beauty and diversity of Romania whenever she can. During her travels she loves to go hiking, snorkeling, wandering around narrow, cobbled streets and exploring underrated destinations.